Free, version 1.1 currently in review. 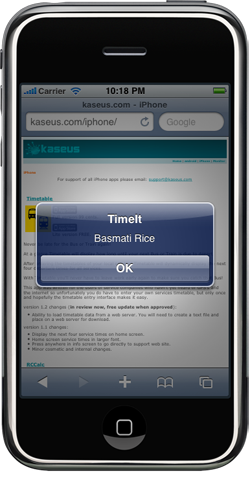 Allows you to set and save a specified time for an alert. Touch the timer name to start the timer or if already started to stop the timer. Uses local notifications so no matter what else you're doing on your iPhone or Touch you'll always get your alert. Press the + button on the top right of the screen to add a new timer. 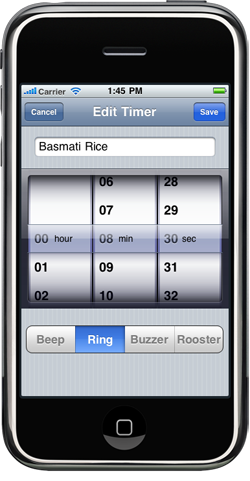 Enter the name of your timer, the time period and what alert sound you'd like. Press on the Save button. Press on the timer name to start the timer. Press again to stop the timer. Once the timer has started you can exit out of TimeIt, the timer will still be working. No matter what else you're doing the timer will alert you when your timer is ready.